Whirling synths, vintage baselines and hushed vocals were what you came to love and expect from indie-rock/pop bands from the late ’00s, and that charm still remains years later in the form of Being No One, Going Nowhere. 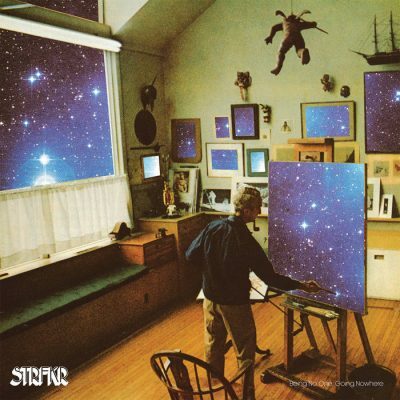 With their fifth studio album, STRFKR hit you with an ’80s-flavored synth accompanied by a funky baseline and percussion in the form of “Tape Machine.” If you have been a fan of theirs since their self-titled debut in 2008, this style should not come as a surprise, because STRFKR have continued to master this style of funky indie rock since their inception. Though this album does not seem to push any boundaries nor experiment much, it does have a solid consistency in catchy choruses and instruments that you could easily get down to. Tracks like “Never Ever” really hit you with the dance feeling of this album and its bubbly synths. There are a good transition of pace and instrumental use in this album: Some tracks are upbeat with high synths or funk-inspired guitar solos (“In The End”), while others are much slower, with an almost outrun-feeling atmosphere. This album continues to follow with the band’s theme of wanting to produce songs that can really be listened to while you dance. For me, the standout track was “Something Ain’t Right,” which has an excellent ’80s induced synth and bass pairing with a really fun, indie-pop chorus. Themes of exploration do come up in this album with its spacey, almost sci-fi synths and images of space used on the album cover, but the interlude track, “Interspace,” most captures this theme. This track in particular adds a think-piece to the album with its use of a building and hypnotic synth played over a quote by the British philosopher Alan Watts about self-discovery relating to one’s place in the universe.